Draft: 2000, Atlanta Braves, 3rd rd. Full name is Blaine Thomas Boyer…resides in Milton, Ga., with his wife, Ginsey and children: Levi and Benaiah... Graduated from Walton High School in Marietta, Ga., in 2000…named an All-American in baseball as a senior, as well as all-county and all-state…also lettered in football and basketball in high school... Serves on the board of Help One Now, a charity that cares for orphans and vulnerable children…also worked with the Deliver Fund, which fights against human trafficking. Appeared in 32 games with the Red Sox after signing with the club as a minor league free agent, April 5... Selected to Boston's roster on May 28, making his Red Sox debut that night vs. Seattle (0.2 IP)... Recorded scoreless outings in 24 of his 32 appearances, including seven-straight between Aug. 31-Sept. 28 (11.2 IP)... Had two stints on the disabled list, missing 10 days with a right elbow strain (July 16-26) and 16 days with a neck strain (Aug. 8-24)... Tied for 14th among AL relievers, inducing seven ground ball double plays... Earned only victory on June 30 at Toronto, tossing 2.0 scoreless innings in the Red Sox's 7-4 win in 11 innings... Fanned a career-high six hitters on July 4 vs. Texas, accounting for all six outs he recorded in a 2.0-inning appearance... Appeared in his 400th Major League game on June 7 at Yankee Stadium. Spent his first season in Milwaukee, pitching 66.0 innings, his most since a career-high 72.0 in 2008 with ATL…Went to spring training as a non-roster invite and made his second consecutive Opening Day roster... Made 61 appearances after appearing in 68 games in 2015…Is one of 27 right-handers in MLB to have at least 61 appearances each of the last two seasons...Fanned 26, the fewest in MLB among pitchers with at least as many innings as Boyer…The last right-hander with as few strikeouts in as many innings was BOS' Aaron Cook (20 in 94.0 IP) in 2012…Boyer's strikeout rate of 9.2% ranked lowest in MLB (minimum 40 innings)... According to MLB's Statcast, out of 265 pitchers who had at least 150 balls put in play against them, Boyer allowed the lowest rate of barreled balls (1.0 percent)…His average exit velocity measured 86.2 mph and ranked 11th…Created by Tom Tango, the Barreled Ball classification is assigned to batted-ball events whose comparable hit types (in terms of exit velocity and launch angle) have historically led to a minimum .500 batting average and 1.500 slugging percentage...Went more than three outs 14 times, including a season-high 2.0 innings eight times. An invite to Twins spring training, Minnesota selected his contract on 3/30 and he went on to make 68 appearances, his most since a career-high 76 in 2008 with ATL...Made Twins Opening Day roster, his first Opening Day roster since 2011 with New York (NL)...His 2.49 ERA tied for the 15th-best among AL relievers (minimum 50.0 innings) ...Appeared in 300th career game, 6/27 at MIL...Appeared 42 games pre-All-Star break, tied for most in the AL...Placed on 15-day disabled list, 8/14-8/26 with right elbow inflammation. Started season with Triple-A El Paso...San Diego selected his contract on 5/22 and made his Padres debut that day vs. CHI, his first MLB game since 4/10/11 with NYM vs. WSH...Returned to El Paso after being designated for assignment, 5/25…Returned to San Diego, 6/15 for the remainder of the season...Retired the first 26 right-handed hitters he faced, 5/22-7/9 before allowing a double to Drew Butera, 7/11 vs. LAD... According to STATS, Inc., it was the longest such streak by a major league pitcher since they started tracking data in 1974...Prior to Boyer, the longest streak belonged to Florida's Eric Ludwick in 1998 and Oakland's Russ Springers in 2009, who both opened their seasons with 24 straight right-handers retired. Returned to baseball, signing a minor league contract with Kansas City and pitching in 13 games for Triple-A Omaha before joining the Hanshin Tigers in the Nippon Professional Baseball league in Japan ..... Went 0-1 with a 3.00 ERA (5 ER, 15.0 IP) over 13 relief outings for the Omaha Storm Chasers before being released by Kansas City on May 16 ..... Signed with the Hanshin Tigers in Japan on May 21 and fi nished the season in the Nippon League, going 3-1 with a 2.67 ERA (8 ER, 27.0 IP) and 21 strikeouts against four walks over 22 relief appearances. Blaine chose not pitch in 2012. Pitched in five games for the Mets, going 0-2 with a 10.80 ERA. Bounced back from early season struggles to become a consistent arm outof the bullpen, allowing one run or fewer in 35 of his final 41 games...Pitchedto a 1.43 ERA (six earned runs/37.2 innings) in those 35 games...Allowed only three home runs over the course of the season, tied for thethird-lowest total among all pitchers with a minimum of 57.0 innings pitched...Out of a possible 50 chances, got a groundball double play 12 times (24percent) to finish second among National League pitchers...Pitched a season-high 3.0 innings June 23 vs. the New York Yankees....Pitched2.0 innings six other times...In 29 home games, he went 2-1 with a 3.62 ERA (13 earned runs/32.1innings) and .231 opponents average with 13 walks and 16 strikeouts...Went 1-2 with a 7.82 ERA (11 earned runs/12.2 innings) and .333 opponentsaverage in 14 games from April 6-May 16 before being designated forassignment on May 18...Was outrighted to Reno (AAA) of the Pacific Coast League on May 21...Infive appearances for the Aces, he went 1-0 with two saves and a 1.50 ERA(one earned run/6.0 innings pitched) ...Opponents hit .227 (5-22) with a walkand nine strikeouts...Converted two straight save opportunities from May25-June 1...Selected from Reno on June 8...Went 2-0 with a 3.25 ERA (16 earnedruns/44.1 innings pitched) and .255 opponents average with 18 walks and 23strikeouts after returning from Triple-A...Held opponents scoreless in 28 of 40 appearances after rejoining the team...Put together eight consecutive scoreless outings at home (9.1 innings) from July 6-August 7, holding opponents hitlessin four of those contests. Went 0-2 with a 4.12 ERA in 48 relief appearances with the D-backs, Cardinals and Braves, including a 0-1 record with a 2.68 ERA in 30 games for the D-backs... In 23 road games, had a 1.75 ERA (5 ER in 25.2 IP) and .226 opponents average (21-for-93) with 8 walks and 13 strikeouts... in 25 home games, had a 6.21 ERA (20 ER in 29.0 IP) and a .297 opponents average (35-for-118) with 12 walks and 16 strikeouts... Allowed 11 of 21 inherited runners to score (52.4%) overall, including 8 of 17 (47.1%) with the D-backs... Opened the season with the Braves, going 0-1 with a 40.50 ERA after giving up 6 runs in 1.1 innings of relief over 3 games... Acquired by the Cardinals on April 20 in exchange for outfielder Brian Barton... in 15 games for St. Louis, posted a 4.41 ERA, allowing 8 earned runs in 16.1 innings... Claimed off waivers from the Cardinals on June 8... Did not allow an earned run in a career-best 8 straight road affairs, over 10.0 innings, from Aug. 1-Sept. 1.. Did not allow an earned run in his final 5 games, a span of 4.2 innings, from Sept. 21-Oct. 2. Tied for ninth in MLB with 76 games pitched....Set career highs in games, innings pitched (72.0 IP), walks (25), strikeouts (67) and losses (6)....Had a 3.16 ERA in 31 day games (31.1 IP) and a 7.97 ERA in 45 night games (40.2 IP). He also had a3.93 ERA in 51 games before the All-Star break and had a 11.17 ERA in 25 games after the break....Over his last 19 games, since 7/30, he allowed 20 ER on 21 hits (5 HR) in 15.0 IP (12.00 ERA)....In May, went 1-0 with a 1.80 ERA and a .218 opponents average in 15 games....Allowed 8 ER on 8 hits in 3.1 innings pitched, including 2 HR over his final four appearances (9/2-9/17)....Had his string of eight scoreless outings (dating to 7/6) snapped by allowing three runs 7/26 at PHI....Went a career-high 2.1 IP on 6/4 vs. FLA (2.1 IP, 1 BB, 2 K)....On 5/24, won first game since 9/25/05 with 1.2 scoreless innings of relief vs. ARI....Picked up his first major league save 5/14 at PHI, allowing one run on three hits in 1.1 IP....Allowed a season-high four runs on three hits in 0.1 IP on 4/29 at WSH....Surrendered a two-run homer to M. Holliday in the 8th inning on 4/8 at COL for his first BS and second loss....Matched his then career high with 2.0 IP on 4/3 vs. PIT and struck out in his first MLB at-bat in the 5th inning. Started the season on the disabled list after straining an oblique muscle during Spring Training when hewent 1-0 with a 1.29 ERA in five games (1 ER/7.0 IP, .174 opponents' avg.). He was activated on 5/7. Made eight appearances at Richmond (AAA) before being recalled to Atlanta on 6/5. He made five reliefappearances from 6/5-12 (0-0, 3.38 ERA) before being optioned back to Richmond on 6/14. He made his first start with the R-Braves on 5/31 at ROC, his first start since 5/22/05 with Mississippi (AA). In 12 starts, he was 3-3 with a 4.75 ERA and in nine relief appearances he was 1-0 with a 3.10 ERA andtwo saves. Finished strong, going 2-1 with a 1.74 ERA in four August games (two starts). Appeared in just two games in an injury-shortened season...Had surgery on his right shoulder on 4/18 and was transferred to the 60-day disabled list on 6/24...Was on the Braves' Opening Day roster, and pitched in two games in the season-opening series at LAD,but was optioned to Richmond after his second outing on 4/5...Allowed hits to four of the five batters he faced on 4/3 at LAD, allowing three runs in just 0.1 IP...Appeared in three spring games (2.1 IP) and allowed three hits and one walk. Appeared in 43 games for the Braves as a rookie, boasting a 3.11 ERA and a .234 opponentsavg...Left 9/26 game with a strained right shoulder and returned in the season finale 10/2 at FLA, allowingthree runs without recording an out, pushing his season ERA from 2.39 to 3.11...Went 4-1 with a 2.05 ERA in23 games at Turner Field; was 0-1, 4.60 on the road...Posted a 1.52 ERA in 30 night games and a 9.00 markin 13 day games...Did not allow a run in 13 August appearances (13.1 IP)...Had his first blown save, butnotched his second win, 9/5 vs. NYM (1.0 IP, 1 R)...Had 15 consecutive scoreless outings (15.1 IP) from 8/2to 9/3...Earned his first Major League win 8/10 vs. SF, entering in the 11th and going 2.0 innings for the firsttime...Took the loss in his ML debut 6/12 vs. OAK (1.0 IP, 2 H, 1R). Fanned D. Johnson for first career strikeout...Was recalled from Mississippi (AA) on 6/12, as RHP Roman Colon was optioned to Richmond (AAA)...Pitched in 14 games (eight starts) at Mississippi and went 2-4 with a 5.03 ERA (1-0, 2.25 as a starter). Was selected to the 2004 Carolina League All-Star team...Led the Carolina League with 154.0 IP, was fifth with a 2.98 ERA and was tied for fifth with 10 wins...The Sports Network selected him as the Carolina League Pitcher of the Week for the week of 5/3. In twostarts, he was 1-0 with a 0.68 ERA and held opponents to a .178 batting average. He struck out ninebatters and walked none in 13.1 IP...Earned first win of the season 4/9 against Wilmington throwing 5.0 innings of scoreless baseball, allowingjust two hits and striking out five Blue Rocks in a 7-0 Pelicans win...Went 7.1 innings only allowing four hits and one run on 5/2 vs. Lynchburg. It was his second win of theseason as the Pelicans won 3-1...Tossed 6.0 innings of five-hit, shutout baseball against the Lynchburg Hillcats on 7/17, earning his 7th winof the year as the Pelicans defeated the 'Cats 5-0. Ranked 5th in the South Atlantic League in wins (12)...Was a key member of the 2003 SAL Champion Rome Braves rotation...Went 8-0 with a 1.81 ERA in 10 games from July 9-August 26 (54.2 IP, 44 H, 16 R, 11 ER, 21 BB, 45 K)...August 4 pitched 7.0 shutout innings (2 H, 1 BB, 4 K) in a 3-1 victory over Lexington...Was 7-1 with a 2.98 ERA in 57.1 IP in 14 road games...Led Rome with 12 wins, ranked 3rd on the team with 136.2 IP and 115 K.
Had a rough month of April (1-4, 8.74 ER, 11.1 IP), but came back strong in June to go 1-0 witha 1.17 ERA in 15.1 innings of work...His 73 strikeouts led the Macon bullpen. Pitched 6 shutout innings in 4-1 win over Bluefield (3 H, 1 BB, 7 K)...Struck out 9 batters in 7.1IP in 14-3 defeat of Kingsport on August 9 (3 R, 3 H, 9 K, 1 BB)...From July 30bAugust 20, went 3-0 witha 3.18 ERA in 5 games (22.2 IP, 17 H, 11 R, 8 ER, 6 BB, 24 K). Began career with the Braves Rookie Gulf Coast League...Tallied a record of 1-3 in first year inprofessional baseball...Turned in a 2.51 ERA, 6th best on the team...9 ER in 11 G second best on the teamamong pitchers playing in at least 10 games. 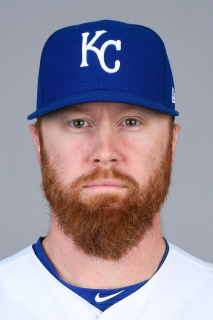 August 15, 2018 Kansas City Royals released RHP Blaine Boyer. August 12, 2018 Kansas City Royals activated RHP Blaine Boyer from the 60-day disabled list. August 1, 2018 Kansas City Royals sent RHP Blaine Boyer on a rehab assignment to Omaha Storm Chasers. July 24, 2018 Kansas City Royals sent RHP Blaine Boyer on a rehab assignment to Northwest Arkansas Naturals. July 5, 2018 Kansas City Royals transferred RHP Blaine Boyer from the 10-day disabled list to the 60-day disabled list. Right lower back strain. May 30, 2018 Kansas City Royals placed RHP Blaine Boyer on the 10-day disabled list retroactive to May 29, 2018. Right lower back strain. March 29, 2018 Kansas City Royals selected the contract of RHP Blaine Boyer from Omaha Storm Chasers. February 16, 2018 RHP Blaine Boyer assigned to Omaha Storm Chasers. February 8, 2018 Kansas City Royals signed free agent RHP Blaine Boyer to a minor league contract and invited him to spring training. November 2, 2017 RHP Blaine Boyer elected free agency. October 12, 2017 Boston Red Sox activated RHP Blaine Boyer. October 5, 2017 Boston Red Sox reassigned RHP Blaine Boyer to the minor leagues. August 24, 2017 Boston Red Sox reassigned RHP Blaine Boyer to the minor leagues. August 21, 2017 Boston Red Sox sent RHP Blaine Boyer on a rehab assignment to Pawtucket Red Sox. August 8, 2017 Boston Red Sox placed RHP Blaine Boyer on the 10-day disabled list retroactive to August 6, 2017. Neck strain. July 26, 2017 Boston Red Sox activated RHP Blaine Boyer from the 10-day disabled list. July 16, 2017 Boston Red Sox placed RHP Blaine Boyer on the 10-day disabled list. right elbow strain. May 28, 2017 Boston Red Sox selected the contract of RHP Blaine Boyer from Pawtucket Red Sox. April 18, 2017 Boston Red Sox signed free agent RHP Blaine Boyer to a minor league contract. April 18, 2017 RHP Blaine Boyer assigned to Pawtucket Red Sox. April 3, 2017 Gwinnett Braves released RHP Blaine Boyer. January 25, 2017 RHP Blaine Boyer assigned to Gwinnett Braves. January 21, 2017 Atlanta Braves signed free agent RHP Blaine Boyer to a minor league contract and invited him to spring training. November 3, 2016 RHP Blaine Boyer elected free agency. April 2, 2016 Milwaukee Brewers selected the contract of RHP Blaine Boyer from Colorado Springs Sky Sox. February 17, 2016 RHP Blaine Boyer assigned to Colorado Springs Sky Sox. February 12, 2016 Milwaukee Brewers signed free agent RHP Blaine Boyer to a minor league contract and invited him to spring training. November 2, 2015 RHP Blaine Boyer elected free agency. August 26, 2015 Minnesota Twins activated RHP Blaine Boyer from the 15-day disabled list. March 30, 2015 Minnesota Twins selected the contract of RHP Blaine Boyer from Rochester Red Wings. January 12, 2015 RHP Blaine Boyer assigned to Rochester Red Wings. December 31, 2014 Minnesota Twins signed free agent RHP Blaine Boyer to a minor league contract and invited him to spring training. November 26, 2014 RHP Blaine Boyer elected free agency. November 20, 2014 San Diego Padres designated RHP Blaine Boyer for assignment. June 15, 2014 San Diego Padres selected the contract of RHP Blaine Boyer from El Paso Chihuahuas. May 27, 2014 San Diego Padres sent RHP Blaine Boyer outright to El Paso Chihuahuas. May 25, 2014 San Diego Padres designated RHP Blaine Boyer for assignment. May 22, 2014 San Diego Padres selected the contract of RHP Blaine Boyer from El Paso Chihuahuas. January 9, 2014 San Diego Padres signed free agent RHP Blaine Boyer to a minor league contract and invited him to spring training. May 17, 2013 Omaha Storm Chasers released RHP Blaine Boyer. January 3, 2013 Kansas City Royals signed free agent RHP Blaine Boyer to a minor league contract and invited him to spring training. August 13, 2011 Memphis Redbirds released RHP Blaine Boyer. July 26, 2011 RHP Blaine Boyer assigned to Memphis Redbirds from Palm Beach Cardinals. July 11, 2011 Blaine Boyer assigned to Palm Beach Cardinals from St. Louis Cardinals. July 7, 2011 St. Louis Cardinals signed free agent RHP Blaine Boyer to a minor league contract. June 17, 2011 Indianapolis Indians released RHP Blaine Boyer. June 1, 2011 Indianapolis Indians placed RHP Blaine Boyer on the 7-day disabled list. May 2, 2011 RHP Blaine Boyer assigned to Indianapolis Indians from Altoona Curve. April 24, 2011 Blaine Boyer assigned to Altoona Curve from Indianapolis Indians. April 20, 2011 Blaine Boyer assigned to Indianapolis Indians. April 18, 2011 Pittsburgh Pirates signed free agent RHP Blaine Boyer to a minor league contract. April 13, 2011 RHP Blaine Boyer elected free agency. April 11, 2011 New York Mets designated RHP Blaine Boyer for assignment. March 30, 2011 New York Mets selected the contract of Blaine Boyer from Buffalo Bisons. January 25, 2011 New York Mets signed free agent RHP Blaine Boyer to a minor league contract and invited him to spring training. January 20, 2011 Buffalo Bisons signed free agent Blaine Boyer. December 2, 2010 RHP Blaine Boyer elected free agency. June 8, 2010 Arizona Diamondbacks selected the contract of RHP Blaine Boyer from Reno Aces. May 21, 2010 Arizona Diamondbacks sent Blaine Boyer outright to Reno Aces. May 18, 2010 Arizona Diamondbacks designated RHP Blaine Boyer for assignment. June 9, 2009 Arizona Diamondbacks activated RHP Blaine Boyer. June 8, 2009 Arizona Diamondbacks claimed RHP Blaine Boyer off waivers from St. Louis Cardinals. June 4, 2009 St. Louis Cardinals designated RHP Blaine Boyer for assignment. April 20, 2009 Atlanta Braves traded RHP Blaine Boyer to St. Louis Cardinals for LF Brian Barton. June 24, 2006 Atlanta Braves placed RHP Blaine Boyer on the 60-day disabled list. April 5, 2006 Atlanta Braves reassigned RHP Blaine Boyer to the minor leagues. March 18, 2004 Atlanta Braves reassigned RHP Blaine Boyer to the minor leagues. November 20, 2003 RHP Blaine Boyer assigned to Atlanta Braves.